McDonald's breakfast was once the only thing that made the terrible time we call morning OK. Now, breakfast is available all day, so it's a little less special, but breakfast is a more the merrier kind of situation, so whatever. And, good news, it's about to get even merrier-er: McDonald's is expanding its breakfast lineup for the first time in five years, and it's doing so with very large, extra-meaty breakfast sandwiches. On November 1, McDonald's is debuting new Triple Breakfast Stacks -- basically, just further-stacked versions of the existing breakfast McMuffin and McGriddle sandwiches. They'll come with two slices of American cheese between two sausage patties, plus bacon and that egg brick thing. You can get the stack as a McMuffin, McGriddle, or as a biscuit (a McBiscuit?). Check out the full spread above. This is the first new McDonald's breakfast sandwich since the Egg White Delight McMuffin (it's regrettable that this one doesn't rhyme, but you can't have it all) in 2013. 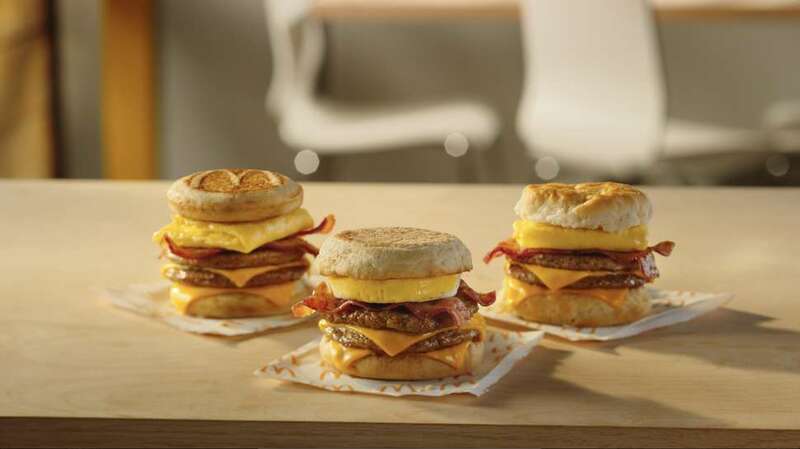 According to McDonald's, the new breakfast sandwiches will be on the menu through December.